Blake Lively was spotted on the set of ‘Gossip Girl’ in New York City earlier today shooting scenes with Elizabeth Hurley. The blonde beauty was wrapped up against the winter chill wearing a black wool coat and a colourful print scarf, but it was her bag which caught my eye. She was carrying the Jimmy Choo ‘Lara’ elaphe-trimmed woven cord shoulder bag. Poking out of her chic multi-coloured Choo was a dark grey Marc by Marc Jacobs ‘Dreamy Logo Commuter’ bag. 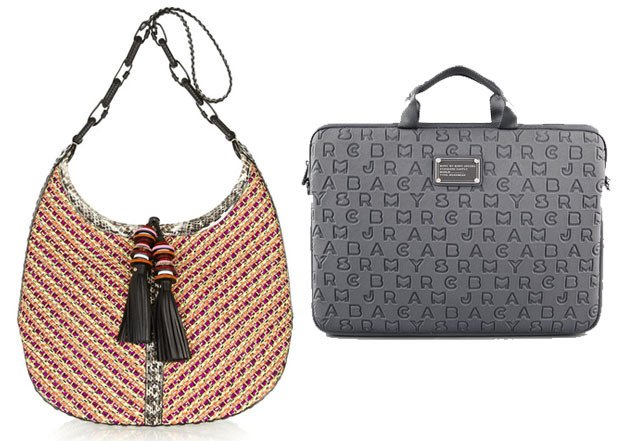 You can buy the Jimmy Choo bag from Net-A-Porter US and Net-A-Porter International. Her Marc by Marc Jacobs laptop case is from Shopbop.com. Which Was Your Favourite Viola Davis 2012 Awards Season Look?